Dee Gordon, National League's Reigning Batting Champion, Gets 80-Game Penalty : The Two-Way Just three months ago, Gordon signed a contract extension with the Miami Marlins that's worth $50 million over the next five years. Dee Gordon had a .333 average and 205 hits last year; this year, he's been hit with a lengthy suspension over two performance-enhancing drugs. 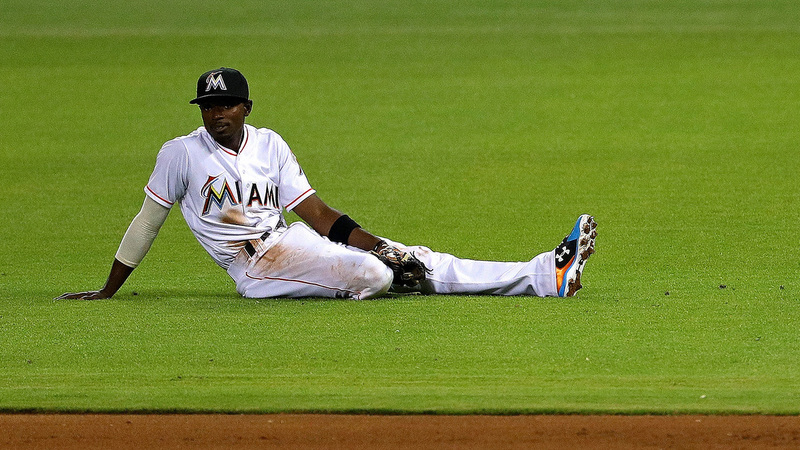 One year after an All-Star season that saw him win awards for his hitting and fielding, Major League Baseball has suspended Miami Marlins second baseman Dee Gordon for 80 games because tests found that he used two performance-enhancing drugs. Gordon tested positive for two banned substances, MLB says: externally derived testosterone and Clostebol, an anabolic steroid. With those results in hand, the league banned Gordon for roughly half of the season, announcing the decision shortly after Miami completed its sweep of the Los Angeles Dodgers — in a game that turned on Gordon's game-tying single in the seventh inning. Gordon, 28, is coming off his best season in the majors, winning the National League batting title with a .333 average and 205 hits in 2015. He also stole 58 bases and won a Golden Glove for his defense — despite spending two weeks on the disabled list for a dislocated thumb last July. "Though I did not do so knowingly, I have been informed that test results showed I ingested something that contained prohibited substances. The hardest part about this is feeling that I have let down my teammates, the organization and the fans. I have been careful to avoid products that could contain something banned by MLB and the 20+ tests that I have taken and passed throughout my career prove this. I made a mistake, and I accept the consequences." As an MLB.com story noted in 2014, Gordon, whose height is listed at 5 feet 11 inches, weighed 144 pounds during his 2011 rookie season. By early 2014, the site said, he had hit "an all-time high of 173." Gordon was an All-Star the past two seasons — with the Dodgers in 2014 and the Marlins in 2015. Just three months ago, he signed a contract extension with the Marlins that's worth $50 million over the next five years. "Dee Gordon is a very important part of our team, and we all love him, and we support him," Marlins president David Samson said after the suspension was announced. "That said, I do not like, or condone, what he did. He's an important member of this organization and will be for many years to come. It's a huge, huge disappointment." After Thursday night's game, Marlins manager Don Mattingly — who has worked with Gordon in both Los Angeles and Miami — said, "I feel like he's one of my kids, to be honest with you. I've known him so long." Mattingly added that he is "definitely shocked and surprised" by the news.